Basements offer nearly endless possibilities when it comes to adding functionality and style to your house. Adding a basement kitchen is great if you love entertaining and want to have the convenience of a kitchen downstairs instead of having to go back and forth between your main kitchen and your basement. You have a few options if you want to be able to cook and entertain downstairs. A full-size kitchen will mimic a traditional kitchen in its design and functionality. It will give you the most options for cooking downstairs but will also require the most planning and money. A kitchenette will give you some additional features, like a sink and extra counter space, for less money, but won’t have all the features that would allow you to completely cook and entertain in your basement. Before you can get cooking, you need to plan out your space. 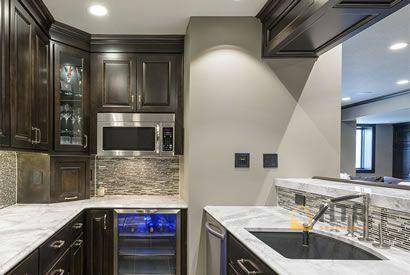 Designing your basement kitchen is an important step, but you also need to figure out things like proper fire exits, ventilation for cooking fumes, and how to install and connect your appliances to the rest of your basement plumbing. These factors will largely play into designing your layout. Our design experts can help you with all of these angles, so you can design a kitchen that’s as beautiful as it is functional. Next, you’ll need to decide on the details. Pick out your flooring, appliances, light fixtures, tile, paint, cabinets, and any other details that you want included in your basement kitchen. The costs for these details can add up quickly, so if you decide that you don’t want to move forward with a full-size basement kitchen, consider installing a kitchenette instead. With a kitchenette, you can still have the convenience of additional counter space, a sink, and a dishwasher, without the extra appliances and details that a full-size kitchen requires.